Over the past decade, concerns about a global "obesity epidemic" have flourished. Public health messages around physical activity, fitness, and nutrition permeate society despite significant evidence disputing the "facts" we have come to believe about "obesity". We live in a culture that privileges thinness and enables weight-based oppression, often expressed as fat phobia and fat bullying. New interdisciplinary fields that problematize "obesity" have emerged, including critical obesity studies, critical weight studies, and fat studies. There also is a small but growing literature examining weight-based oppression in educational settings in what has come to be called "fat pedagogy". 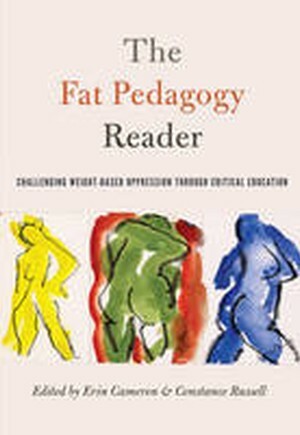 The very first book of its kind, The Fat Pedagogy Reader brings together an international, interdisciplinary roster of respected authors who share heartfelt stories of oppression, privilege, resistance, and action; fascinating descriptions of empirical research; confessional tales of pedagogical (mis)adventures; and diverse accounts of educational interventions that show promise. Taken together, the authors illuminate both possibilities and pitfalls for fat pedagogy that will be of interest to scholars, educators, and social justice activists. Concluding with a fat pedagogy manifesto, the book lays a solid foundation for this important and exciting new field. This book could be adopted in courses in fat studies, critical weight studies, bodies and embodiment, fat pedagogy, feminist pedagogy, gender and education, critical pedagogy, social justice education, and diversity in education. Contents: Ellen S. Abell: Picking the Bones - Tracy Royce: Fat Invisibility, Fat Hate: Towards a Progressive Pedagogy of Size - Victoria Kannen: "How Can You Be Teaching This? ": Tears, Fears, and Fat - Linda Bacon/Caitlin O'Reilly/Lucy Aphramor: Reflections on Thin Privilege and Responsibility - Cat Pause: Promise to Try: Combating Fat Oppression Through Pedagogy in Tertiary Education - Amy E. Farrell: Teaching Fat Studies in a Liberal Arts College: The Centrality of Mindfulness, Deep Listening, and Empathic Interpretation as Pedagogic Methods - Esther D. Rothblum: Weapons of Mass Distraction in Teaching Fat Studies: "But Aren't They Unhealthy? And Why Can't They Just Lose Weight?" - Pamela Ward/Natalie Beausoleil/Olga Heath: Creating Space for a Critical Examination of Weight-Centered Approaches in Health Pedagogy and Health Professions - Moss Norman/LeAnne Petherick: The Enemy Within: Teaching "Hard Knowledges" About "Soft Bodies" in a Kinesiology Faculty - Lisette Burrows: "Obesity" Warriors in the Tertiary Classroom - Hannah McNinch: Fat Bullying of Girls in Elementary and Secondary Schools: Implications for Teacher Education - Richard Pringle/Darren Powell: Critical Pedagogical Strategies to Disrupt Weight Bias in Schools - Lori Don Levan: Recognizing and Representing Bodies of Difference Through Art Education - Jan Wright/Deana Leahy: Moving Beyond Body Image: A Socio-Critical Approach to Teaching About Health and Body Size - Angela S. Alberga/Shelly Russell-Mayhew: Promoting Physical Activity for All Shapes and Sizes -Patti Lou Watkins: Inclusion of Fat Studies in a Difference, Power, and Discrimination Curriculum - Erin Cameron: Learning to Teach Every Body: Exploring the Emergence of a Critical "Obesity" Pedagogy - Krishna Bhagat/Shannon Jette: An "Intervention" Into Public Health Interventions: Questioning the Weight-Based Paradigm - Caitlin O'Reilly: Mitigating Weight Stigma Through Health Professional Education - Heather Brown: Fat Studies in the Field of Higher Education: Developing a Theoretical Framework and Its Implications for Research and Practice - Constance Russell/Keri Semenko: We Take "Cow" as a Compliment: Fattening Humane, Environmental, and Social Justice Education - Breanne Fahs: A Tale of Three Classrooms: Fat Studies and Its Intellectual Allies - Emma Rich: A Public Pedagogy Approach to Fat Pedagogy - Michael Gard: Navigating Morality, Politics, and Reason: Towards Scientifically Literate and Intellectually Ethical Fat Pedagogies - Constance Russell/Erin Cameron: A Fat Pedagogy Manifesto.